As winter drags on I am finding that I need something to help me get through the last leg of this journey, and I am not a fan of the in flight movie. 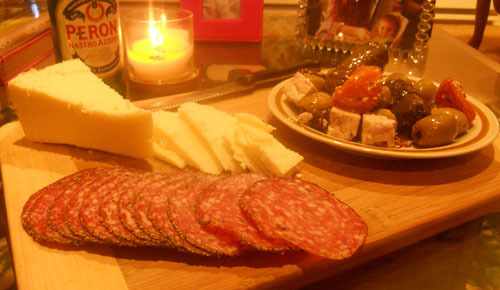 So the other night the boy came over and we caught up on The Office, feasted on meats and cheeses and drank Peroni. I am not an expert with this sort of thing so I let someone at Market District tell me what I to do. “An Asiago cheese would be nice to compliment the pepper salami,” said the helpful store associate. Ok, sounds good! 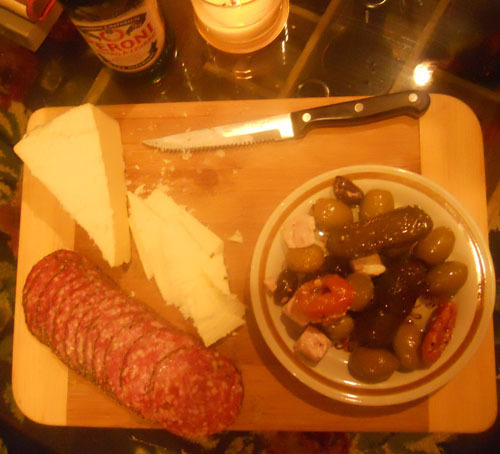 The olives, I was able to pick out using my own devices, and are a greek mix with feta and kalmata from the olive bar. This isn’t going to make spring weather come sooner, but it did make me feel better in the mean time. Do you have any favorite meat and cheese pairings?